A gorgeous vintage cream candelabra, with elegant crystal droplets, that will stand beautifully in the middle of your tables. It is 36.5cm in height (without candles), it is a truly beautifully elegant design. Please scroll down the page for booking and delivery details. Full payment is required to hire any of our products. Please check availability with us as soon as you can as they get booked up very quickly. 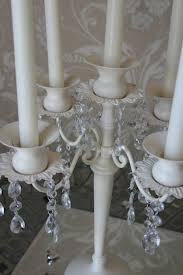 We do require a £20.00 security deposit per candelabra. This will be returned to you on safe return of the item. Please get in contact to check availability first to make sure your date is free. Hire is available for 4 days, to ensure that there is no rushing around, but other lengths of time are available depending on your requirements. There are several options for hiring our products. You are able to collect free of charge from RH6, alternatively we can arrange delivery direct to your venue or other location convenient to you. We deliver within a 25 mile radius (delivery charges apply). Get in contact to check availability, as dates are getting booked up very quickly!